North Booval is a suburb of Ipswich, Queensland, Australia. At the 2016 Australian Census, the suburb recorded a population of 3,175. 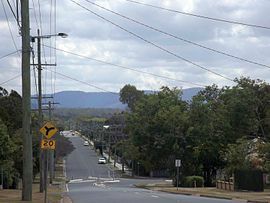 North Booval is largely defined by the courses of the Bremer River and Bundamba Creek between which it lies; and the Main Line railway. North Booval is serviced by Booval railway station, which is located on its southern border. ^ a b Australian Bureau of Statistics (27 June 2017). "North Booval (State Suburb)". 2016 Census QuickStats. Retrieved 25 March 2018.